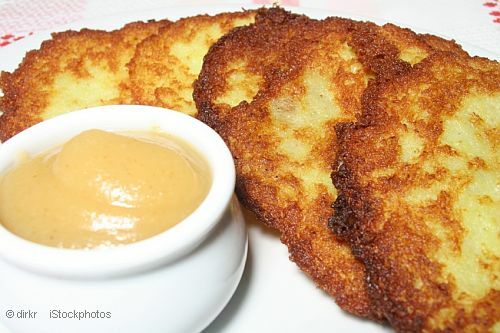 German potato pancakes are a quick and easy vegetarian dish. In catholic regions they are a traditional meal on Fridays. Children and adults love Kartoffelpuffer. Serve them with sweet or salty side dishes for a change, and you can have them on the menu weekly. 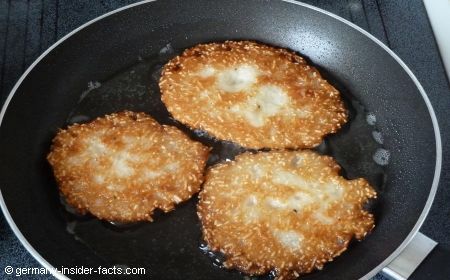 Apart from Kartoffelpuffer, potato pancakes are also known as Reibekuchen and Kartoffelpfannkuchen in Germany. Although the Reibekuchen always contain salt, they are often eaten with sweet applesauce or plum compote. Some people even sprinkle sugar on top. On the salty side, they are eaten with liverwurst, or served with smoked salmon and sour cream. 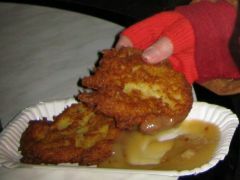 But the most traditional way to eat potato pancakes is with apple sauce. This is the basic recipe, very delicious as it is. You can add chopped chives, pepper, nutmeg, or finely diced bacon. Peel and wash the potatoes, peel the onion. Add eggs and salt and mix well. Heat a portion of the oil in a non-stick pan, drop 1 spoonful of the potato dough into the hot oil, flatten the dough with the spoon. Add another spoonful for 1 or 2 more pancakes. If the dough merges carefully separate each Kartoffelpuffer. Turn the pancakes over as soon as the edges turn brown. Cook them until they are golden brown. When the Reibekuchen are finished, dab them dry on kitchen paper. Put them on a warm plate in the pre-heated oven to keep them warm until you finished with the rest of the pancakes. For very crispy results, take a little less than one spoonful of the potato dough, and flatten thoroughly. If you prefer them a bit soft inside, take a full spoon of dough, and don't flatten too much. I admit that sometimes I am a bit lazy when it comes to cooking, so I don't mind using convenience/instant products occasionally. Pfanni is one of my favourites, and their potato pancakes are delicious. Whether you make your own, or use a convenience product, enjoy the German potato pancakes. Guten Appetit.